Growth form: Parasitic perennial herb. Flowering. Mar. Status: Native. Local. Also recorded: Bahrain, Kuwait, E Saudi Arabia, UAE. Habitat & distribution: On damp, saline sand, including beaches. Frequent at Dukhan water treatment works, growing on Tetraena qatarensis and nearby on the west coast (John Norton); also occurs at Ras Laffan (Renee Richer), Mesaieed and Khor Al ADebbie Allanid (Mohammed Al Safran). 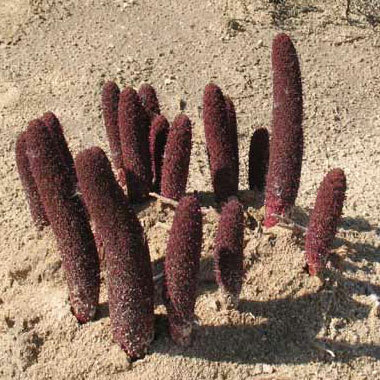 Other host plants include species of Chenopodiaceae. Uses: The roots are edible and were sold in earlier times as a vegetable. Flowers were used as a dye in Saudi Arabia (Ghazanfar); used as a aphrodisiac in Bahrain (Rizk & El-Ghazaly).